Car Owner: Brian Woodhall Sr. If you weren't racing what would you be doing? Finding a way to race. How long have you been interested in racing, and how did you get started racing yourself? I've been interested in racing since I was 5 years old on my first trip to watch the go-karts race at Blanket Hill. Who has had the biggest impact on your racing career and why? Mydad has the biggest impact on my racing career because we do this as a "team" and we support each other. 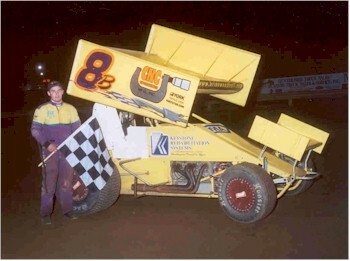 How did you come up with the number eight for your Sprint Car? Do you plan on staying in Sprint Cars, or do you have plans of moving to another division? Right now I want to focus on Sprint Cars, but if the opportunity arises in the future, I would consider all opportunities.